For years, the attendances of Lille have been a source of mockery for the rest of France. Of course, first Stade Grimonprez-Jooris and later Stade Lille-Métropole were poor homes, but a city the size of Lille, with over a million inhabitants, surely should be able to fill the 18,000 seats of Stade Lille-Métropole. From this season onwards though, the image of Lille not being a football city may finally change. And the reason for this was the opening of the new Grande Stade Lille-Métropole on Friday night. Lille’s Grand Stade has been the first large French stadium to open since the Stade de France in 1998, and the first club stadium since Parc des Princes in 1972. It is a textbook example of a modern multifunctional stadium. It can serve as a football or rugby stadium for 50,000 spectators, be converted into a concert stadium for a maximum of 56,000 people, and even be boxed up into smaller indoor concert or sports arenas with capacities ranging from 8,000 to 29,500. The stadium has, of course, a retractable roof, which can be opened and closed in 30 minutes and blocks any sunlight from entering. It also has ample corporate facilities and all you expect from a stadium that came at a cost of €300 million. Perhaps not the most spectacular stadium at first sight, after all, it does not have a shiny exterior that light up, nor a single-stand kop, and not even bright-red seats, but it seems that it ticks all boxes in terms of providing a great football experience. Which is also why 50,000 people showed up for the opening, and more importantly, that over 30,000 season tickets have been sold. Which means that the club has already proved the critics wrong that argued that 25,000 seats would be more than enough for a new stadium. No spectacular opening match though, but a regular league match to kick things off. Guests were AS Nancy, who put up more of fight than many in the stadium had likely expected, and the home team therefore had to settle for a 1-1 draw. 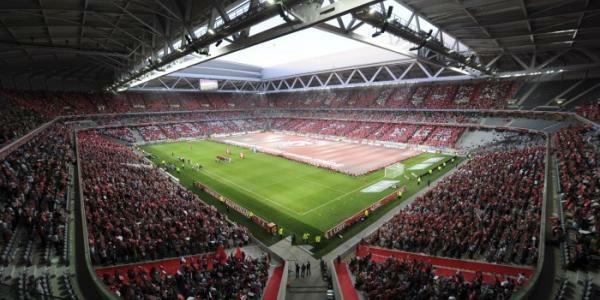 If Lille survives the play-offs versus FC Copenhagen in the next weeks, the Grand Stade will already witness Champions League football in its first season, though the stadium’s big event will be the European Championships that will be held in France in 2016, and during which it is expected to at least host a quarter-final. It is also a prelude of more to come, as both Nice and Lyon are already building new stadiums, Bordeaux is expected to do so within the next year, and extensive renovations will transform the stadiums of Saint-Etienne and Marseille. Photo credit: © Lille OSC official Facebook page.